For the past decade a series of Science Mission Directorate (SMD)-funded projects have advanced the technology readiness of both Mars-prototype drills and the automation needed to operate them at significant lightspeed communication-lag distances from Earth. Drilling will be needed to access the Martian subsurface at depths of 1 meter or greater, and to penetrate the ice layers found by the Phoenix mission at the poles. It is the best means to retrieve samples from regions on Mars that could possibly harbor life now or in the past, and is a core sample acquisition technology for multiple mission concepts. A photograph shows both the Icebreaker-1 rotary-percussive drill and its sample transfer arm, in the context of July 2012 Arctic tests at Haughton Crater. The Deployable Automation Technologies (DAT) group at NASA Ames with Honeybee Robotics conducted sample acquisition and drilling automation field tests with Icebreaker-1 in July 2012 (Haughton Crater) and January 2013 (University Valley, Antarctica). The Icebreaker-1 rotary-percussive Mars-prototype drill with its sample-transfer arm, in July 2012 tests at Haughton Crater’s Drill Hill. The current GETGAMM project (led by PI Lisa Pratt at Indiana University, with GSFC, JPL, and Honeybee Robotics) uses deeply eroded Paleoproterozoic bedrock in southwestern Greenland as an analogue for Mars. In a three-year field campaign, the project analyzes seasonal and diurnal variation in the concentration and isotopic composition of methane, ethane, and hydrogen sulfide in bedrock boreholes. See http://www.indiana.edu/~geosci/pratt/getgamm/index.html . GETGAMM is using the Icebreaker-2/LITA drill to drill arrays of 1-2m boreholes for gas monitoring. 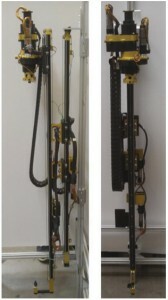 The Icebreaker-2 drill itself is derived from the Honeybee Robotics Icebreaker-1 drill, but uses a lighter frame with smaller motors to reduce fielded mass from 32kg (Icebreaker-1) to 9.6kg (Icebreaker-2/LITA). The Life In The Atacama (LITA) or Icebreaker-2 drill is a smaller, lighter 10kg Mars-prototype drill derived from the 33kg Icebreaker-1 rotary-percussive drill system. Since an Icebreaker-2 drill was already built and would already be available in the Arctic this summer, the DAT group at Ames proposed to use it for other tests after GETGAMM concluded its season in mid-July. “This allows us to cheaply and quickly get additional baseline drill performance data at a common analog site (Haughton Crater) at a fraction of the cost of a dedicated field test,” said Dr. Brian Glass, DAT group lead at Ames. This data will be invaluable for future study, development of drill fault detection and automation software, and for comparison to other prototype drill baselines (for future Mars sample acquisition mission design and trade studies). After receiving approval of this opportunistic proposal from SMD, the DAT group and Honeybee have put together over two months a field deployment of Icebreaker-2 to test at Haughton. 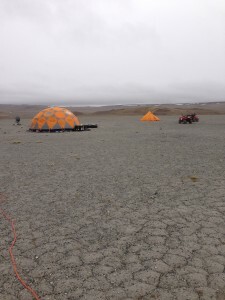 A group of three left California on Friday, August 9, arrived at Resolute on August 10 and arrived at Haughton Crater on Devon Island on August 12. They are currently testing the latest Icebreaker-2 model at the same “Drill Hill” site as was used to test three earlier drills in 2004-12: DAME, CRUX and Icebreaker-1. In collaboration with the GETGAMM project, the Icebreaker team will also sink several gas-sampling shafts and gather samples for GETGAMM’s use from Devon Island, supplementing the Greenland data. 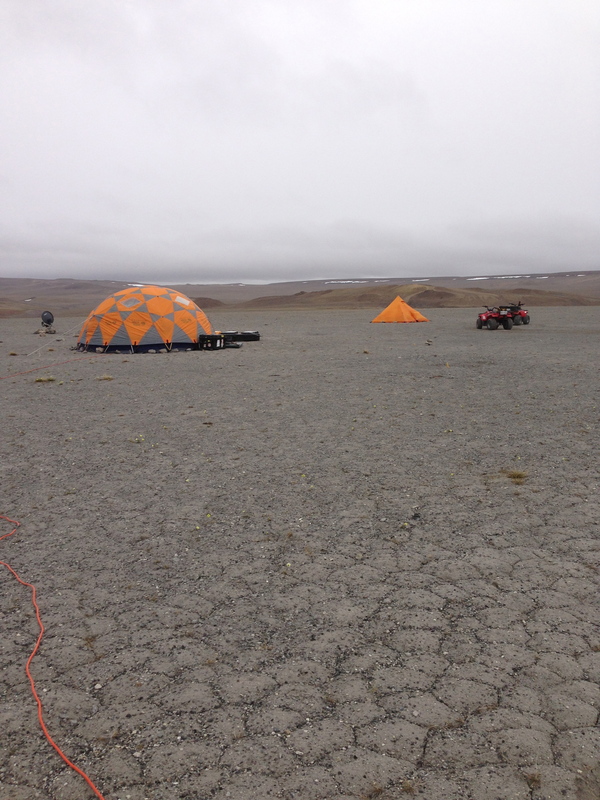 The Icebreaker team’s drill test camp, set up in August 2013 at “Drill Hill”, a massive impact breccia deposit within Haughton Crater.